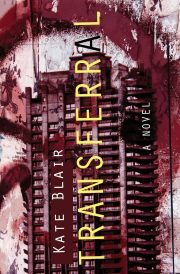 2016’s Transferral is a debut novel from Canadian-by-choice author Kate Blair. It is not listed as such on her ISFDB entry because she does not have an ISFDB entry—someone should get on that—but her website confirms the info. The weed of crime may bear bitter fruit in our world but in sixteen-year-old Talia’s world, crime produces endless snotty hankies. Once science provided the means to move diseases from one human to another, it didn’t take long for lawmakers to see that this could be a perfect tool to reward decent citizens while punishing lawbreakers. Break a minor law and receive some law-abiding citizen’s cold. Break a major crime and say hello to necrotising fasciitis. Talia, herself a survivor of a brutal crime that left her sister and mother dead, has no doubts about the morality of the transferral system of punishment. What could possibly be wrong with making sure good things happen to good people by ensuring that bad things happen to bad people?